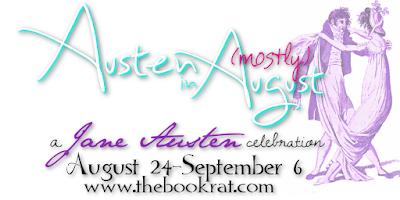 I don't recall if I ever actually shared this video during one of our Austen in August celebrations (since it originally went up in April), but I was binge-watching old AIA videos the other day (there's some gold there, people! ), and I came across this Friday Reads excerpt of Spies & Prejudice. The quality is horrible, and the lighting is not my friend, but the excerpt made me laugh all over again. I was going to link it up as today's ICYMI post, but I thought instead, I'd share it in all its glory. And if you missed it, here's what I thought of the book, back when it came out. Oh this does sound fun. I'm not familiar with Veronica Mars, but it sounds like a modern day Nancy Drew type character. Thanks for sharing your older video reading the excerpt. It IS like modern day Nancy Drew, but sassyyyyyyyy. Oh man, is it sassy. Veronica Mars is MUST WATCH for anyone who likes strong, intelligent, sassy teenage girls, whodunits, and damn smart writing. Sassy, smart, and strong, is great. I'll have to look these up.